The following issue I find to be quite an interesting one, took some digging and guessing to figure this one out - perhaps this can save someone some time. A while ago we created some shared add-ins for office 2007 & 2003 using Visual Studio 2008, the add-ins worked great, but on some Office 2003 machines it didn't work at all. The moment the office application started, it disabled these add-ins immediately. 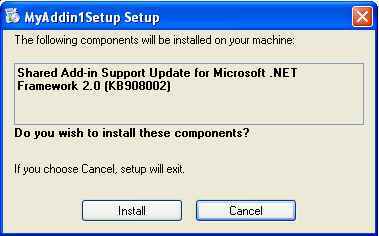 The reason being that Office 2003 doesn't natively support .NET (managed) based shared add-ins - for this reason (among others) Microsoft released a patch KB908002. There is however a funny thing regarding this patch, it requires Visual Studio 2005 and Microsoft didn't include this fix in Visual Studio 2008 (and I couldn't find a 2008 specific version of the patch). The workaround is simple though, this patch added a prerequisite to the contents of KB908002 to Visual Studio 2005, which we need to deploy to the end user machine - the prerequisite itself doesn't actually require Visual Studio. What we need to do is to extract the prerequisite and manually add at it to the folder containing deployable prerequisites for Visual Studio 2008. Download the patch from http://support.microsoft.com/kb/908002. Extract the files from the patch e.g. You will notice an item called Shared Add-in Support Update... in the list (the one we just added), tick this item to include it as prerequisite for Office 2003 add-ins. Once we click on install, this will register/install the assemblies (like Extensibility.dll) required to run shared add-ins on Office 2003. Dude, this is awesome! I thought by the end of the year I would not have any hair left... You saved me a trip to the hair doctor! Thank you so much! Keep up the good work.